Our beloved Dufour 35 family yacht was built in France by Michel Dufour S.A. She has never been chartered and has had only two previous private owners since new; we have had her for the last decade. She is stable, reliable and fast - but we have to sell her. We only sail the Aegean from Spring to Autumn and keep her ashore all winter. Sailing with her, from April to October almost every year with family and friends, for short or longer periods is pure joy and fun. We used to sail the islands of Cyclades and Sporades, as well as the main eastern coast of the country. She has been the companion of our family; has enough room to sleep 6-8 pers and her expansive main table offers a place for every one of us around it. Outdoor dining is also great and preferred to indoor, given the wonderful Mediterranean weather. She has spacious and safe side decks, good size cockpit covered with removable outdoor cushions. She provides a large amount of space and accommodation for a sailboat of her size (please see plans/photos, or ask for more) and plenty of equipment/accessories are to go with her (detailed catalogue on request). We have only had minor problems all these years which had our prompt attention. She was kept in various ports (always following our family’s location) from Athens to Volos and recently Limni, Evia (2 hours drive from Athens airport). 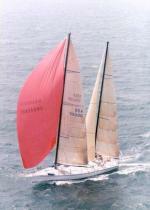 She is in very good shape and always ready to sail but she needs some work like cosmetic stuff (e.g. deck paint and some interior decor etc) to look perfect again. The mark ‘fair/good condition’ refers to this work and this obviously reflects to her low price. 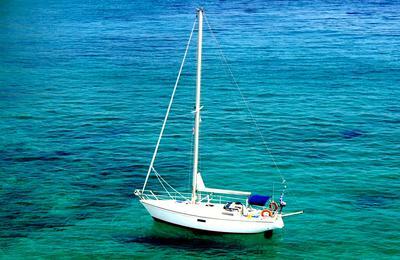 She is an ideal sailboat for holidays in Greece or elsewhere in the Mediterranean. Electronics: Wind, Speed with time laps, Depth met. Mahogany interior with GRP headlining. Saloon: U-shaped settee. It converts to a double and a settee (single berth) opposite. There are also two upper berths over these beds. Large expansive saloon table, opening deck hatch, lots of storage and shelving. Number of Berths: 6-8. Forward cabin. 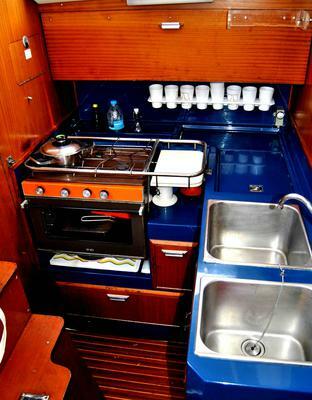 Double berth; opening hatch to deck, shelving around, hanging locker and storage under berth. Captain’s post. 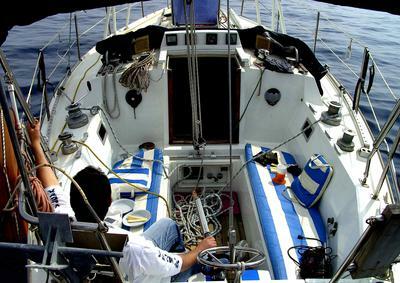 Chart table is to starboard opposite the galley with all instrumentation and maps, VHF, GPS, Music station, etc. 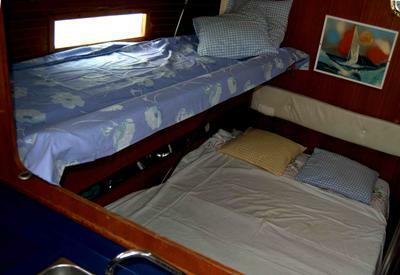 Quarter berth aft of chart table. Water Tanks/Pumps: 160+160+150 total 470lt under births, 1 electric and 2 pedal pumps. Galley. L-shaped located beside the steps. Three gas burner cooker on top with gas oven underneath. Two stainless steel sinks, cool box with two lids and plenty of storage room all over. Pedal and electric pump. Heads. Marine toilet to port (new flush system 2013) between saloon and forward cabin with separate hand basin. Opening upper hatch for ventilation and light. 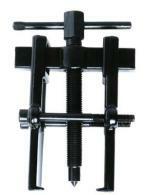 CQR primary Anchor with chain and windlass. Stainless Steel framed teak Foldable Boarding Passerelle. Stainless steel swim ladder with slip-proof teak treads. Foldable Sun Shade and Spray Hood with stainless steel frame. Plastimo Dinghy with Yamaha Selva outboard 4stroke 4Hp. Sony-music radio CD with mp3 stick and indoor+outdoor speakers. No need to swear Mike; I do believe you. I've been "lurking" around your ad for a while 'cause I'm not quite ready. Hope all goes well. No! I do. Really! Thanks for your message. You wrote to me "I confess I have not yet read the specification thoroughly so I may have more questions soon", so please do so and I will answer all your specific questions about my Dufour35. Many thanks for your interest. Have you tried calling or texting him on the number he's given? I have tried to email the vendor twice but have received no response - any suggestions? Clearly a much loved and well-equipped cruising boat.